When I left school I had to choose between a place I had been offered at Art College or a conventional career. I chose the latter and although it was successful it took virtually all of my time and energy and I did very little painting over the next 30 years. Then in 2005 I took the opportunity of early retirement and shortly afterwards I started painting again, in oils, en plein air (in the open air). I predominantly paint landscapes and living in the Kent Weald provides me with a wealth of subject matter on my doorstep or a short drive away. I love working on location with my subject live and in front of me – it is challenging and sometimes frustrating but above all it is inspirational and totally addictive. Experiencing nature while trying to capture “that moment” brings me a heightened awareness of sights and sounds. My aim is to allow my paintings to portray my personal interpretation - hopefully giving the viewer a new perspective. My paintings are held in private collections throughout the UK and I have had buyers Internationally from as far afield as Australia. May 2017: My painting "June afternoon, Nick's Lake" received a "Highly Commended" in the Artist Category, Patchings 2017 Competition/Exhibition and will feature on the Patchings Art Centre website from 13 July. Jan 2017: Selected for The Royal Society of British Artists Annual Exhibition 2017 at the Mall Galleries with my painting "The old apple orchard - early April". Exhibition runs 22 March to Saturday 1 April 2017. Jan 2017:	Received notification that I am a finalist in the Kent Life Landscape Painter of the Year competition. I am invited to attend a preview launch at Lovelys Gallery, Cliftonville, Margate on	3rd March. My selected painting will then be displayed in the gallery at Lovelys for 2 weeks. Dec 2016: The two paintings that I entered for the Royal Society of British Artists Annual Exhibition 2017 have both been pre-selected. 29 Oct to 16 Dec 2016: Participating in the "Small is Still Beautiful" exhibition at Smallhythe Studio. Sept 2016: Selected by the Editor to be featured in the Online Gallery page of the November 2016 issue of Leisure Painter for my painting "Smallhythe Sky". July & Aug 2016: on 3 dates - Running oil painting for beginners, en plein air workshops from Weavers Studio, Sutton Valence. June 2016: Exhibiting and demonstrating during the South East Open Studios event 3rd to 19th June at Smallhythe Studio. April 2016: My painting "Apple Blossom in May" has been accepted in the Artist Category for Patchings 2016 Competition/Exhibition. The exhibition at Patchings Art Centre, Nottinghamshire runs from June 9th to July 24th. 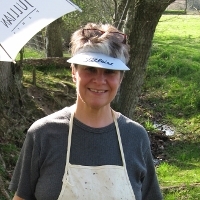 Feb 2016: Invited by Joanne Weaver to teach oil painting en plein air. I will be one of four artists teaching at her new Sutton Valence art studio (See Workshops page). Dec 2015: Participation in the “Small is Beautiful” Exhibition at Smallhythe Studio together with the launch of “Different Eyes”. Oct 2015: Invited by Rowena McWilliams to be 1 of 8 artists sharing Smallhythe Studio for SEOS 2016. Sept 2015: Work pre-selected for The Royal Society of Oil Painters Exhibition 2015. Aug 2015: Invited by Smallhythe Studio to be one of a group of five artists who meet up once a month to share ideas, their work and skills and to spend time being creative together. We had our first meeting in October 2015 and we named our group “Different Eyes”. Aug 2015: Invited to exhibit at the “Small is Beautiful” exhibition taking place at Smallhythe Studio 1st to 19th December. June 2015: Exhibiting and demonstrating during the South East Open Studios event 5th to 21st June at Smallhythe Studio. April 2015: Asked by Painters-Online, website for The Artist and Leisure Painter Magazines, to feature in an e-newsletter on how I completed one of my paintings "The Bluebell Woods, Rolvenden". I was thrilled to see this included in their May 2015 e-newsletter circulated to more than 30,000 recipients. April 2015: My painting "The Dutch Barn, Hawkhurst" received a "Highly Commended" in the Artist Category, Patchings 2015 Competition/Exhibition and featured on the Patchings Art Centre website. Dec 2014: Selected by Rowena McWilliams as 1 of the 9 other artists sharing Smallhythe Studio with Rowena for SEOS 2015. Nov 2014: Selected as the December 2014 editor's gallery choice for my painting "Hay Bales Newenden 1" from the painters-online website. My piece can be seen in the December issue of The Artist magazine. Aug 2014: Invited to exhibit at the "Silver" exhibition taking place at Smallhythe Studio 2nd to 20th December . June 2014: Invited to exhibit at the “Pairs” exhibition taking place at Smallhythe Studio 26th July to 3rd August. April 2014: My painting "Flooded Fields, Newenden" received a "Highly Commended" in the “Artist” Category, Patchings 2014 Competition/Exhibition. Jan 2014: Two works pre-selected for The Royal Society of British Artists Exhibition 2014. Aug 2013: Invited to exhibit as a member of the “Artists of The Rother Valley” Christmas show. June 2013: Paintings accepted for exhibiting at Wild at Art Gallery, Cranbrook. June 2013: Works accepted for Lovelys Summer Open Art Exhibition in Margate. May 2013: Attendance at West Dean College for a course of study under plein air landscape artist Tom Benjamin. May 2013: Work accepted for The Artist and Leisure Painter 2013 Patchings Open Art Competition. Nov 2012: Invited as a guest artist to exhibit with “Artists of The Rother Valley” at their annual Christmas art show in Northiam. June 2012: Winner of the “Winston Oh Award” at The Artist and Leisure Painter /Patchings 2012 Competition. My painting “February Snow, Rolvenden” featured in the October 2012 issue of Leisure Painter Magazine. This painting sold at Patchings and is now in the private collection of the Editor of Leisure Painter Magazine. June 2009: Prize winner at the Rolvenden “Painting for Prizes” Competition.